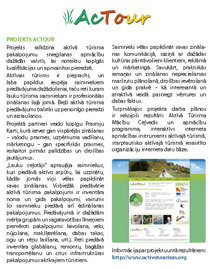 ACTOS project dissemination in a local seminar at "Brūveri", Sigulda region, on 17.04.2012. Asnāte Ziemele presents the project achievements to seminar participants - 54 rural tourism entrepreneurs. 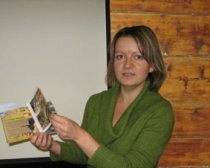 Ieva Mežzīle presenting the project brochure to seminar participants at „Branguļi” guest house in Engure district, 21.08.2012. Asnāte Ziemele and seminar participants discussing active tourism training at „Branguļi” guest house in Engure district, 21.08.2012. Juris Smaļinskis presenting the project brochure to seminar participants at „Zvejnieki”, Lubānas district, 24.08.2012. 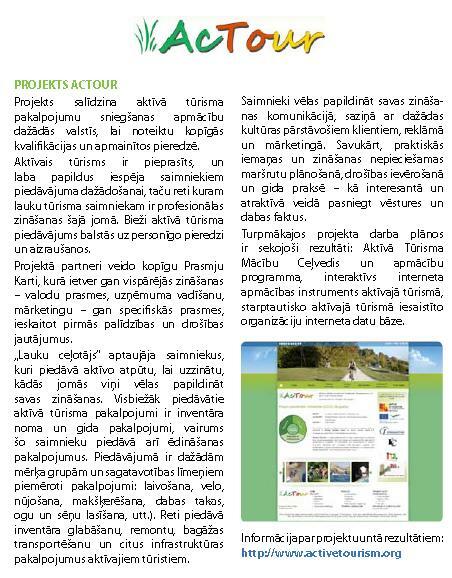 Seminar participants are presented the project web site at „Zvejnieki”, Lubānas district, 24.08.2012. Dace Garsele-Bērziņa presenting the project brochure to seminar participants at „Duntes Urdzinas”, Limbažu district, 05.09.2012. Seminar participants discuss the active tourism skills map, „Duntes Urdzinas”, Limbažu district, 05.09.2012. 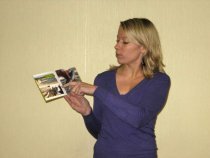 Anna Palelione presenting the project brochure to seminar participants at „Avoti”, Līgatnes district, 11.09.2012. 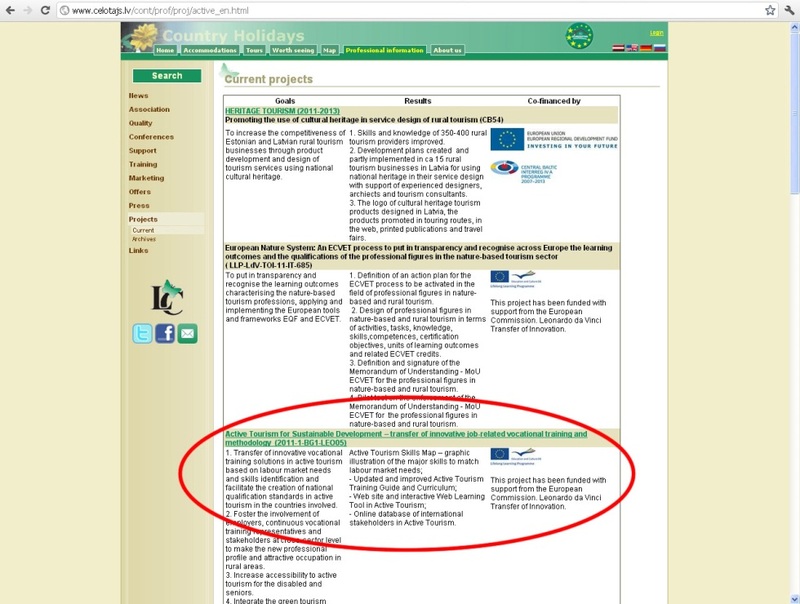 On 25.09.2012 project results – active tourism brochure, training profile and program were presented in association board meeting in Riga. 10 persons participated. 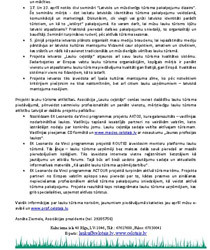 Project seminar „Knowledge and skills required in active tourism services”, 03.10.2012, Limbaži district, Ungurmuiža. During seminar project activities and developed training curriculum were presented, situation in active tourism sector discussed. Totally 17 persons participated. Seminar „Working group meeting for Training guide development”, 03.10.2012, Igate. Project goals and expected results were presented. Participants discussed the active tourism section in Training guide. Totally 15 persons participated. 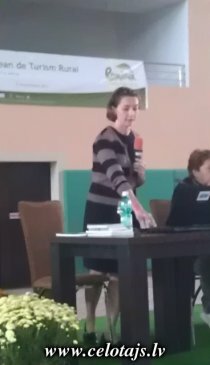 Asnāte Ziemele presented project activities in European Rural Tourism congress in Pietra nemt, Romania on 07.10.2012. 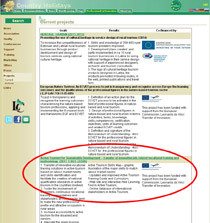 Discussion „Active tourism – Professional service in Latvia”, 17.10.2012, Inčukalns district. Asnāte Ziemele informed participants about project activities and discussion about active tourism issues was held. Discussion involved Project partners from Spain, Slovenia and Bulgaria to give their country experience about training active tourism professionals. 30 persons participated in discussion. 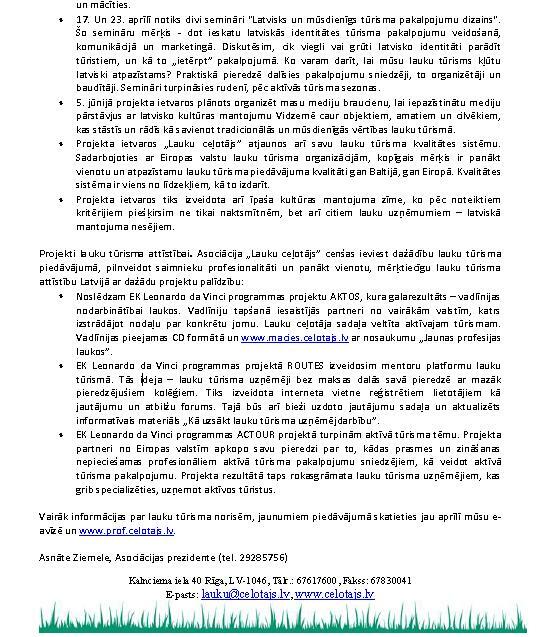 Project presentation to EuroGites delegation, 20.11.2012, Kukšas. 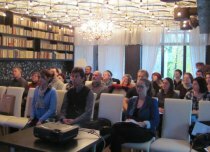 Participants were informed about project, it’s activities, results and active tourism situation in Latvia. 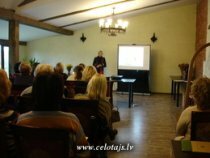 Training curriculum „Active tourism for sustainable development” was presented. 11 persons participated in event. Seminar „Green certificate” meeting, 17.12.2012, Rīga. Participants were presented the project activities and informed about Active tourism handbook development. 10 persons participated in this meeting. Seminar „Green certificate” meeting, 22.01.2013, Rīga. Participants discussed Active tourism handbook development. 9 persons participated in this meeting. Seminar „Training opportunities for active tourism service provider”, 01.02.2013, Engure district. Project goals and expected results were presented. Participants discussed the active tourism section in Training guide. 15 persons participated.